Three teenagers have been arrested by police investigating the cause of a blaze which engulfed part of a West Yorkshire school. More than 60 firefighters tackled the blaze at Castleford High School in Ferrybridge Road on Thursday night. West Yorkshire Police said it was too early to say whether the fire was started deliberately. The youths, all aged 16, are being questioned by detectives. Fire service specialists are analysing the debris. 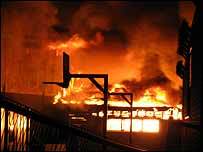 The sports hall was completely gutted by the fire and the administration block damaged by water. Police have appealed to anyone who saw the fire, or anyone who was in the area before it began, to contact them.